In this post, I’d like to illustrate how auxiliary tasks can be beneficial for machine learning. I’ll first define this notion, provide examples and show how these tasks are usually incorporated in the mathematical formulation of deep learning problems. I’ll then propose an alternative approach and present first experimental results for this approach. In machine learning, auxiliary tasks are tasks we try to accomplish with the sole objective of better performing one or several primary tasks. This situation, referred to here as auxiliary learning, contrasts with multitask learning1, for which we are genuinely interested in accomplishing well all tasks, and single task learning, for which only one task is considered. the indication whether each patient survived or died. Rich Caruana and his colleagues’ primary task was to identify patients that were more likely to survive and should then not be hospitalized. In this context, the lab results, available only after hospitalization, couldn’t be used as inputs. However, it was still possible to take advantage of them. Rich Caruana and his colleagues tried, as an auxiliary task, to predict the lab results based on the basic measurements. They thus reduced the error rate for their primary task by 5-10%. For the sake of clarity, let’s consider only the case of a single primary task and a single auxiliary task (generalizing to an arbitrary number of primary and auxiliary tasks is straightforward). Let’s suppose further that these tasks correspond to the minimization of a primary loss and an auxiliary loss . In the context of deep learning, the standard approach2 is to use a single neural network for both tasks, with shared layers followed by task-specific layers, and to apply a gradient descent-based method to minimize the weighted sum of the two losses . The corresponding gradient is . The underlying intuition is that minimizing will lead to more meaningful representations in the shared layers and that these representations will be leveraged by the layers specific to the primary task. In the standard multitask approach, is a constant value3. Its purpose is to balance the primary task and the auxiliary task. 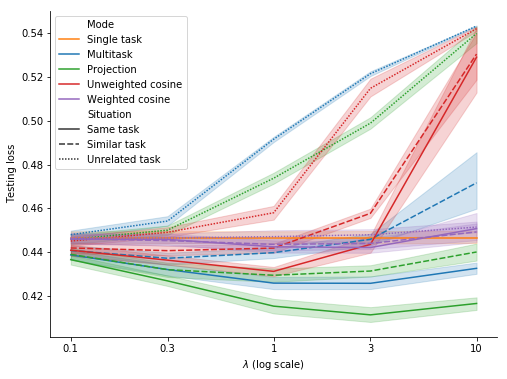 corresponds to single task learning whereas increasing gives more and more influence to the auxiliary task. The approach described above has provided very good empirical results. However, an auxiliary task may be unhelpful or even harmful for the primary task. The latter case, which is called negative transfer, is a central challenge of auxiliary learning. Moreover, using a weighted average of and suggests we’d be willing to tolerate a higher value of if it helped sufficiently decrease . On the contrary, reducing the auxiliary loss is only looked for to the extent this contributes to reducing the primary loss. closer to than , to avoid following a direction detrimental to the primary task. Otherwise said, is the projection of on the half-space of vectors whose cosine similarity with is positive. If a critical point of hasn’t been reached yet (i.e. if ), this ensures that will decrease if the learning rate if small enough. If and form an acute angle, both projection and unweighted cosine leave unchanged whereas weighted cosine reduces its norm with the cosine similarity of these vectors. In particular, weighted cosine strongly shrinks when it becomes almost orthogonal to . If and form an obtuse angle, both unweighted cosine and weighted cosine just ignore . In contrast, projection only negates the component of which is collinear to . (Du, Czarnecki, Jayakumar, Pascanu, & Lakshminarayanan, 2018) explicitly tries to favor auxiliary tasks similar to the primary task. For example, weighted cosine completely ignores the auxiliary task when and are orthogonal. In my intuition, an auxiliary task’s purpose is to bring a new perspective. It should nudge us towards interesting regions of the parameter space we wouldn’t have explored with only the primary task in focus. 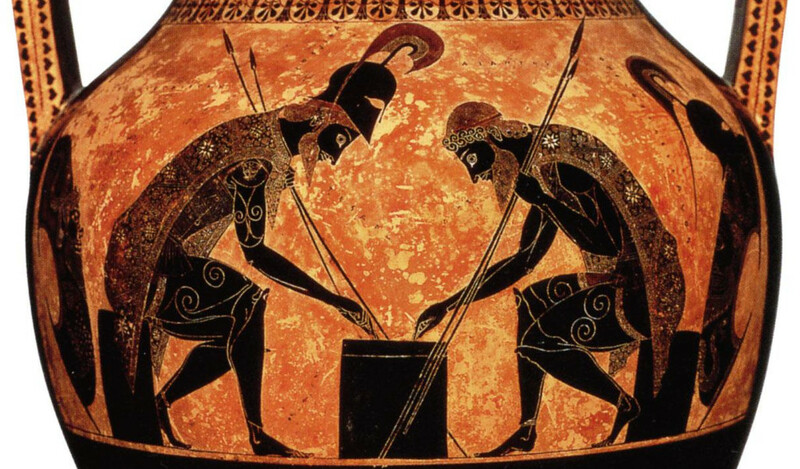 Therefore we can try to negate the component of which seems clearly harmful to our objective but we shouldn’t necessarily discard auxiliary tasks dissimilar to the primary task4. Let’s now look at some experiments. They were performed with Tensorflow and you can find the corresponding notebooks and additional results on GitHub. We start with a minimalistic example to illustrate how substituting with gives priority to the primary task while still allowing progress on the auxiliary task. In the euclidean plane , we try to find a point that, above all, minimizes the square distance to the unit circle and, only if it doesn’t increase this distance, also minimizes the square distance to point (2, 0). This is a slight departure from the principle of auxiliary learning described above. Here we want to accomplish both the primary task and the auxiliary task even if the primary task is the absolute priority (performing the primary task alone would be too easy). The solution of this problem is of course and we try to reach it by using a gradient descent-based algorithm starting from point with . With multitask, the point converges to a location close to but different from (1, 0) because of the distraction the auxiliary task creates. With projection, the point follows as expected the same trajectory as with multitask before reaching the disk of radius 1 and center (1, 0), i.e. as long as and form an acute angle. Afterwards, the point slightly deviates from the multitask trajectory to reach (1, 0). The trajectory for unweighted cosine is also the same before reaching the disk of radius 1 and center (1, 0). Afterwards, the point abruptly changes course in the direction of the unit disk as the auxiliary task is ignored. When the point arrives at the unit disk, it starts oscillating around its edge. It’s then intermittently influenced by the auxiliary task and follows the unit circle until reaching (1, 0). With weighted cosine, the point follows a more direct trajectory towards the unit circle. It then arrives close to the intersection between the unit circle and the circle of radius 1 and center (1, 0), i.e. a location where and are orthogonal. It stagnates there for a while because the auxiliary task is mostly ignored then converges to (1, 0) by following the unit circle. With this example, projection, unweighted cosine and weighted cosine allow to find the correct solution but the convergence is notably quicker with projection (this is also the case for other starting points). Figure 5 shows the trajectories with the vanilla gradient descent algorithm (learning rate: 0.01) and tells a different story. With unweighted cosine and weighted cosine, the point now stops on the unit circle far from (1, 0). This is because, in the absence of momentum, it eventually stays on the side of the unit circle where and form an obtuse angle. The auxiliary task is then never taken into consideration anymore. A similar behavior can be seen with other starting points. In summary, the proposed method works as intended with these toy examples: it helps accomplish both the primary task and the auxiliary task while giving precedence to the former. The following experiments are based on the CelebA (or large-scale CelebFaces attributes) dataset (Liu, Luo, Wang, & Tang, 2015) and inspired by (Zhang, Luo, Loy, & Tang, 2014). The CelebA dataset contains many face images annotated with 40 binary attributes such as Attractive, Young, Eyeglasses or Black Hair, and the locations of 5 facial landmarks : left eye, right eye, left mouth corner, right mouth corner and nose. The primary task for these experiments is to determine whether a face is attractive (or at least attractive in the annotators’ eyes) and the auxiliary task is to locate the facial landmarks. The corresponding losses are the cross entropy error function and the average quadratic error. The pictures were downsampled to and converted to gray-scale to make the tasks more challenging and reduce computation time. 10000 of them were included in the training set, the validation set and the test set. I used the neural network depicted on Figure 7 as in (Zhang, Luo, Loy, & Tang, 2014) and trained it with the Adam algorithm and early stopping. 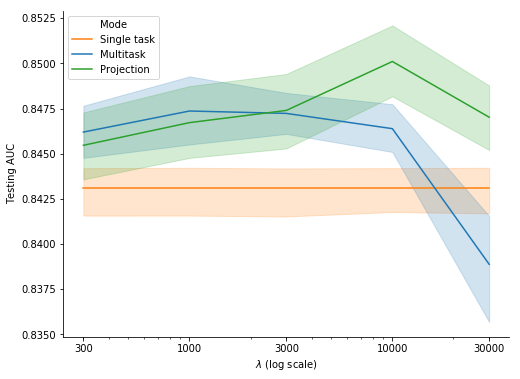 The classification performance deteriorates as the influence of the auxiliary task becomes excessive with high values of , especially for multitask which performs worse than single task for . We can compare these results with those for unweighted cosine and weighted cosine on Figure 9. The unweighted cosine curve and the weighted cosine curve are very close to respectively the projection curve and the single task curve for . However, their testing AUC drops for . We can note that the weighted cosine curve falls between the single task curve and the unweighted cosine curve, which comes as no surprise. 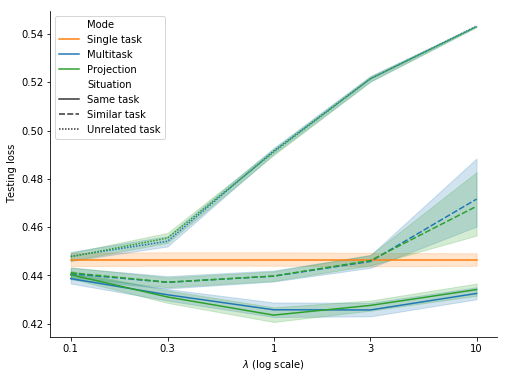 The last series of experiments follows (Chen, Badrinarayanan, Lee, & Rabinovich, 2018) and uses a synthetic dataset to control the adequacy of the auxiliary task. where acts element-wise, is a real-valued vector of length and is a real-valued matrix. , and be constant real-valued matrices whose elements are drawn IID respectively from , and . For the input data (i.e. ), the training set, the validation set and the test set include respectively 1000, 1000 and 10000 vectors whose elements are generated IID from . Moreover and as opposed to the previous series of experiments, the training sets are distinct for the primary task and the auxiliary task. If these sets were the same, the auxiliary task wouldn’t add any value when . As (Chen, Badrinarayanan, Lee, & Rabinovich, 2018), I used the vanilla neural network depicted on Figure 10, which I trained with the Adam algorithm and early stopping. when the auxiliary task is the same as the primary task, it significantly contributes to the performance of the primary task for all 5 values of . when the auxiliary task is similar to but different from the primary task, it helps for but becomes neutral or harmful for . when the auxiliary task is unrelated to the primary task, it’s detrimental to the performance of the primary task for . Figure 12 shows the same results as Figure 11 for 3 values of . With and even more with , projection yields clearly better results compared to multitask for all 3 situations5. 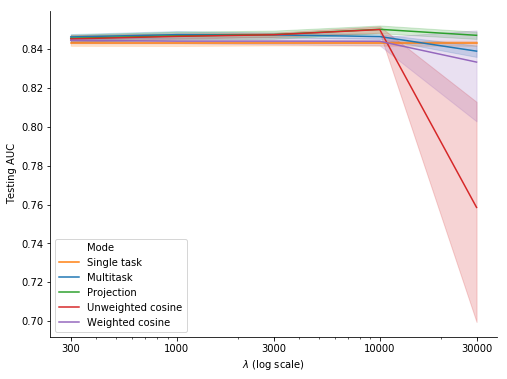 Figure 13 zooms in on the case , for which unweighted cosine and weighted cosine provide better results than multitask and projection only when the primary task and the auxiliary task are unrelated. Leveraging auxiliary tasks is an elegant way to improve learning, especially in the case of supervised learning with too few labelled examples or reinforcement learning with sparse rewards. However, auxiliary tasks may sometimes hurt the performance on the primary task. In this blog post, I proposed a simple and intuitive method to mitigate such risk of negative transfer. I tested it in a few basic scenarios, in which it brought moderate but statistically significant gains over the standard multitask approach. This is a promising start but more diverse and elaborate experimental settings would be necessary to draw general conclusions on this method’s relevance or compare it with its alternatives. Many thanks to the authors of the inspiring articles listed below and the developers of the great tools used for this post: Tensorflow, the SciPy ecosystem, Seaborn, Google Colab, PlotNeuralNet and Jekyll. Many thanks as well to Sebastian Ruder for his valuable feedback. Caruana, R., Baluja, S., & Mitchell, T. (1996). 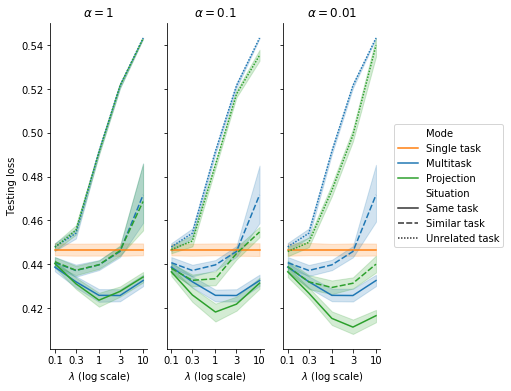 Using the future to "sort out" the present: Rankprop and multitask learning for medical risk evaluation. In Advances in neural information processing systems (pp. 959–965). Vincent, P., Larochelle, H., Bengio, Y., & Manzagol, P.-A. (2008). Extracting and composing robust features with denoising autoencoders. In Proceedings of the 25th international conference on Machine learning (pp. 1096–1103). ACM. Zhang, Z., Luo, P., Loy, C. C., & Tang, X. (2014). Facial landmark detection by deep multi-task learning. In In ECCV. 94–108. Mordan, T., Thome, N., Henaff, G., & Cord, M. (2018). Revisiting Multi-Task Learning with ROCK: a Deep Residual Auxiliary Block for Visual Detection. In Advances in Neural Information Processing Systems (pp. 1317–1329). Trinh, T. H., Dai, A. M., Luong, T., & Le, Q. V. (2018). Learning longer-term dependencies in rnns with auxiliary losses. ArXiv Preprint ArXiv:1803.00144. Mikolov, T., Sutskever, I., Chen, K., Corrado, G. S., & Dean, J. (2013). Distributed representations of words and phrases and their compositionality. In Advances in neural information processing systems (pp. 3111–3119). Jaderberg, M., Mnih, V., Czarnecki, W. M., Schaul, T., Leibo, J. Z., Silver, D., & Kavukcuoglu, K. (2016). Reinforcement learning with unsupervised auxiliary tasks. ArXiv Preprint ArXiv:1611.05397. Burda, Y., Edwards, H., Pathak, D., Storkey, A., Darrell, T., & Efros, A. A. (2018). Large-scale study of curiosity-driven learning. ArXiv Preprint ArXiv:1808.04355. Du, Y., Czarnecki, W. M., Jayakumar, S. M., Pascanu, R., & Lakshminarayanan, B. (2018). Adapting auxiliary losses using gradient similarity. ArXiv Preprint ArXiv:1812.02224. Liu, Z., Luo, P., Wang, X., & Tang, X. (2015). Deep Learning Face Attributes in the Wild. In Proceedings of International Conference on Computer Vision (ICCV).